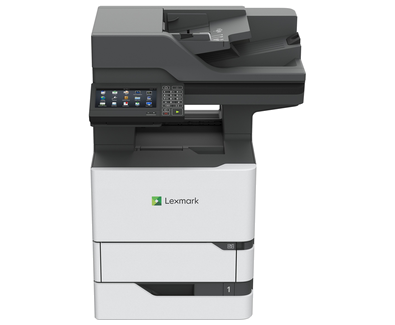 Output of up to 70  ppm* and a standard hard disk help the flexibly configurable, OCR-equipped Lexmark MX722adhe monochrome multifunction product to meet large-workgroup needs. A first page as fast as four seconds sets the stage for printing and copying at up to 70  ppm*, backed by the powerful combination of 1.2-GHz quad-core processor, standard hard disk and up to 6 GB of memory. Single-pass two-sided scanning at up to 150  spm completes the speed equation, bolstered by bigger-than-ever 200-page document feeder capacity.